This is a site dedicated mainly to my love of wood and furniture design. If you love wood and fine woodwork, you will like this site. Within these pages you will find over a hundred images detailing my works and designs in wood. Many are found in my Portfolio, and many others are found in the Works in Progress page; with lots to look at inbetween. 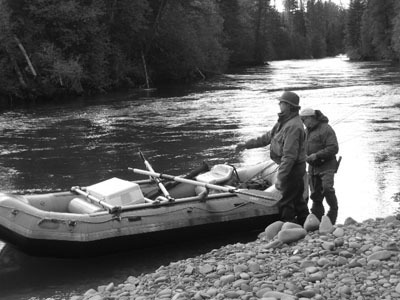 You will also find links to my other sites all about steelhead flyfishing and birding in northwest British Columbia. Spring 2001: Springtime again folks and look what the Easter bunny is up to! The Sullivan Table: Another approach to an Arts and Crafts table. Latest Images! Updated November 2000. The Curved Screen July 1999, see also the Portfolio link to view the finished screen. For anglers only. . .a little fish picture. I have lived in the Kispiox Valley in north-west British Columbia, Canada since May of 1994. I make my living primarily from two sources: my workshop, and as an angling guide. I built a 1500sq. ft. wood shop shortly after moving here on part of the property my family and I live on. Late fall, winter, and most of the spring have me in the shop involved with furniture and other woodworking projects; while a good part of the summer and certainly all of the fall (the fishing season) has me outside as much as I can (which is alot). It is a kind of seasonal lifestyle that greatly appeals to me. My guiding business is a very steady part of my annual cycle. It is the other part of who I am and how I live and as a business is always growing and is as vibrant and dynamic as I can manage. Please feel free to have a look at my web-based annual guiding news letter. . . which you can get to right here. The name: Mykiss... someone once called it a "double entendre", which I guess means that it can mean two things...whatever. 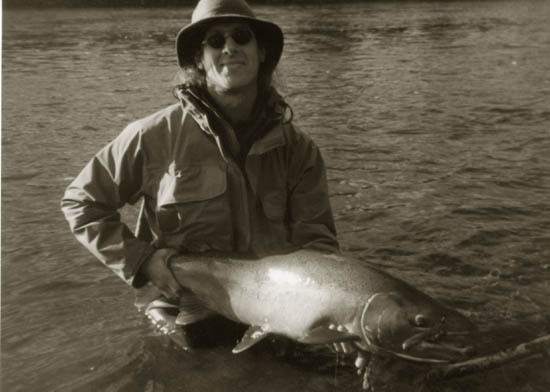 I took it because it is from the latin name for steelhead: onchorynchus mykiss and is a direct reference to my other passion: that of fly fishing for steelhead and more importantly, just being on these wonderful rivers every summer and fall. My experience in the field of furniture making and design is a combination of high school, work experience, self teaching, and the excellent time spent in the Fine Woodworking Program at the College of the Redwoods in Fort Bragg, California in 1989/90. My instructors: James Krenov, Michael Burns, David Welter, and Jim Budlong, all had so much to offer. The nine months spent there greatly influenced my ideas about wood, design, and furniture. I have pieces in homes all over North America. I sell my work by commission out of my workshop, and through several galleries in the Pacific North-west in Washington state and in the Vancouver area in B.C. I have many sources of inspiration when it comes to designing and creating pieces of furniture. They range from The College of the Redwoods, traditional Japanese crafts, some aspects of Modernism, Art Deco, the Arts and Crafts movement, and the natural world around me. Lately I have been looking closely at the tremendous carving and artistic heritage of the Gitksan people, the first nations people here in the Hazelton/Kispiox valley area in north-west B.C. They have a very long cultural legacy of wood craft which remains vibrant to this day. Above all, though, it is the wood itself that moves me to create. There are few materials that can come close to the incredible range of colors, textures, and even scents that the woods of the world possess. It is to allow this material a voice, one which will live on for generations, which ultimately is my goal when creating a piece. When the function of the piece is in harmony with that goal, then I have achieved something good. I believe my designs have a fairly contemporary, clean line; but I have never set out to turn the design world on its ear. I don't do avant garde furniture. 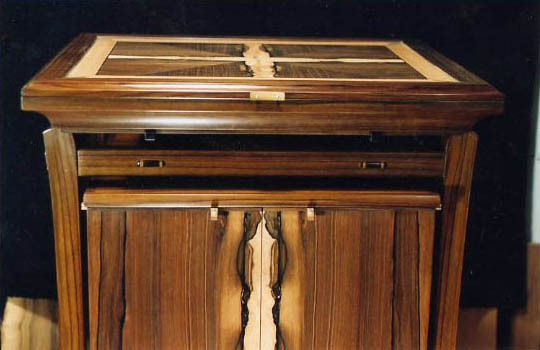 All of my work is constructed in, and consequently bears the hallmarks of, a European tradition of cabinet-making. 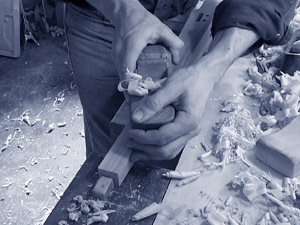 The methods of construction - the dovetails, the mortice and tenon, dowelling, frame and panel, coopering, and veneering- are consistent with this tradition not because I believe in quaint notions of the "olde tyme country craftsman", but because these methods are inherently suited to the nature of the material. I believe that all craftspeople live and work in a continuum of ideas. There is essentially no such thing as originality, we are all connected to one and another, if by nothing else, our common craft heritage: by the works of those who have gone before us. Their work lives on in the blending of ideas, new materials, and constant change that drives the force of creation. What is new is simply the vanguard of what has gone on before. Only through diligence, patience, and serious devotion to one's craft will you acquire the deeper understanding needed to fully realize and bring into being pieces which accomplish their functional requirements and at the same time fully acknowledge the limitations and possibilities of the material. To do this all with a sense of reverence and yet remain mindful of the poetic and lyrical possibilities of the material, and turn this towards the lines that define the forms. . . this is craft, poetry, and art all realized at once. There is nothing mysterious about it: we observe, we feel, we act...we learn. And repeat...spiralling upward toward a refinement of idea, spirit, and process. Most of the works shown on this site are not for sale, they are already out of my hands and in the world at large. If you like what you see, I welcome your inquiry via any of the methods of communication listed below. I am always interested in entertaining new design ideas, but also it is fun to revisit an old idea and try a variation on one of the pieces that are on this site. I would emphasize the concept of "variation", as every piece is truely unique. I do not get into any kind of production on my furniture, and as every piece in some way responds to the woods used they inevitably develop a character of their own. That is the joy of handmade furniture! I am fully capable of digital online correspondance, and have been very successful in developing design ideas with clients and bringing pieces into fruition all through being "wired". The work, "Ovals", is one example of an almost completely wired exchange of ideas and development of a project this way. Faxes and email attachments began the process with a hand drawn line drawing, then we used the camera to email updates and demonstrate mocked-up details. Regular email photo updates allowed for further discussion as the project progressed. Having said that, I would add that I begin all of my design ideas in the shop, on paper, with a pencil. I still feel that for the forms that please me this is a more comfortable place to start. I can send regular updates on any works in progress through any of the mentioned means that are compatible with your level of "wiredness".